India semiconductor industry is one of the fastest growing semiconductor industries in the global market, wherein, VLSI Design service market is now becoming a key contributor. Design centers can be classified as captives and non-captives design centers. Non-Captives design centers accounts for more than 30% of the total market revenues in this industry. According to 6Wresearch, India VLSI design service market is expected to reach $3.02 billion by 2017, growing at a CAGR of 16.25% during the period 2012-2017. The report provides the unbiased and detailed analysis of the on-going trends, opportunities/high growth areas, market drivers which will help the stakeholders to device and align their market strategies according to the current and future market dynamics. India VLSI design service market has seen significant changes in its market over the years on account of entrance of new players in the market. We now see, industry experts with more than 10 years of experience establishing their own organizations in the industry. 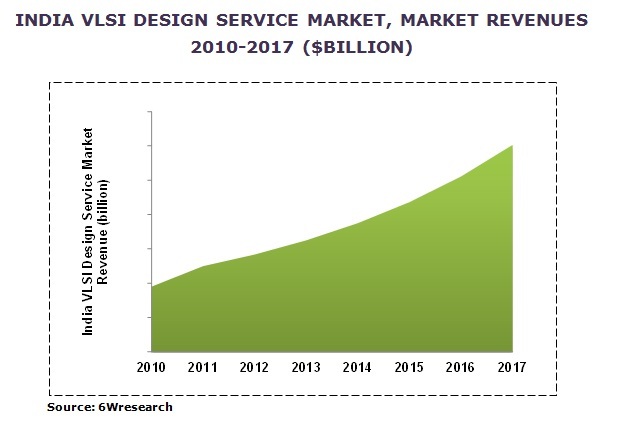 According to 6Wresearch, India VLSI design service market generated $1.25 billion in 2011 and is expected reach $3.02 billion by 2017, with a CAGR of 16.25% from 2012-2017. The report provides the unbiased and detailed analysis of the on-going trends, opportunities/high growth areas, market drivers which will help the stakeholders to device and align their market strategies according to the current and future market dynamics.